On December 19th,2012, I was having lunch with my friend Kendra in Kathmandu. Right as I took my first bite of chicken chilly she suddenly leaned over and said, “So, do you want to do Everest basecamp trekking in a week?” “What? !” I had to fight not to cough up the spicy peppers. She was leaving Nepal is a couple of months, and was dying to see Everest Base Camp before she left. January and February were no good because most locals left the mountain to escape the snow and cold, and her flight left early in March. “It’s now or never…” She sat there staring at me, grinning madly until we both started laughing. I guessed it was now. It was 6 am on December 26th and we were boarding the flight to Lukla out of Kathmandu’s domestic airport. It had been a mad few days working with Base Camp Trekking to get everything together, having decided only a week ago to go trek to Everest Base Camp with my good friend Kendra. Oh and we invited two new friends to join us on the trek, Rickard and Chris. I only met the two Swedish boys three days before while I was out in Thamel, Kathmandu’s colorful tourist district. When I mentioned I was going to trek to Everest Base Camp they immediately asked to join. “But can we arrange everything so quickly?” they had asked. I stuffed cotton into my ears as the airplane’s propeller started. 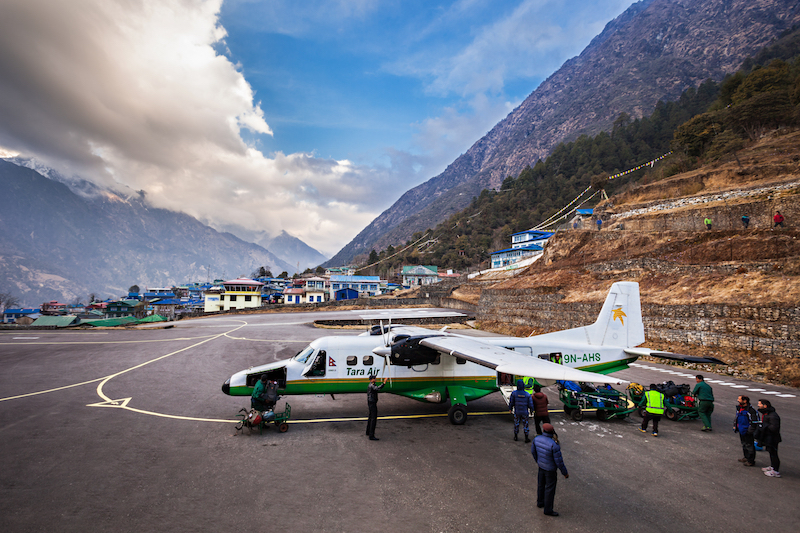 In Nepal the airplanes that take you into the mountains are small and compact, and they feel every jolt of wind. Flying in the mountains is a bit scary, with strong winds and unpredictable climate. But what a thrill it was to land in Lukla! There isn’t much to descend when you fly to those heights, and that descent is terrifyingly quick as you realize your airplane is literally flying into the side of a mountain. The runway is angled uphill, so that as planes land they slow down more quickly – extremely important on such a short runway! And then it was over. Twenty-five thrilling minutes of spectacular views and exhilarating shakes and we landed in Lukla, ready to start our trek. After meeting our porters in Lukla, the five of us – Kendra, Chris, Rickard, me, and our guide Sujan – set off after them to our first stop. It was always amazing to see how fast and light-footed our porters were… No matter how far behind us they started, they always ended up ahead of us. Our first day was short – just a quick 4 hour hike to get down to the village of Phakding. We planned our days, especially in the beginning, to help our bodies adjust to the altitude (a process called acclimatization) – something anyone who ventures to the mountains has to prepare for, especially in Nepal. To help us acclimatize, we planned two rest days on the way up. And after a long uphill climb our first rest day was coming up in Namche Bazaar, the famous Himalayan mountainside city. We walked by walls of manis, or prayer wheels stuffed with Tibetan Buddhist scrolls, and stones as large as houses with the chant Om Mani Padme Om intricately carved into them over and over. Prayer flags danced in the wind over every pass and bridge we crossed, and we finally made it to Namche. The city was much bigger and busier than I had pictured, all carved into the mountainside with a maze of alleys crisscrossing through it, and spectacular views of nearby Kongde mountain. It was hard to imagine the quiet Himalayan village Sir Edmund Hillary had described over half a century ago. That same place was now bustling – replete with both old and new, from monasteries to coffee shops, Internet cafes, and even bars. If you forgot to bring anything you’ll find it here. Still, the city wasn’t too crowded – December was low season after all. Crowds were nonexistent, prices were cut in half, and the city was quiet after dark. It’s almost like we had the place to ourselves. The next few days of trekking proved more challenging, but spectacular nonetheless. For one, while leaving Namche we had our first great view of the one and only Mount Everest, known also as Chomolungma or Sagamartha. Seeing it finally brought home the reality that we really were going to visit the highest mountain in the world. It’s what drove me forward every time I felt tired or out of breath. Speaking of out of breath, we were really starting to get high. I’ve always found it thrilling to get over 3,000 meters, where the landscape becomes more barren and the sweeping views more dramatic and clear. And in December the views were magnificent. Our days were crystal clear, sunny, and cool – perfect trekking weather. At night it got very cold, but by the time the sun had set we were all huddled up in the lodge kitchens by the warm stoves. 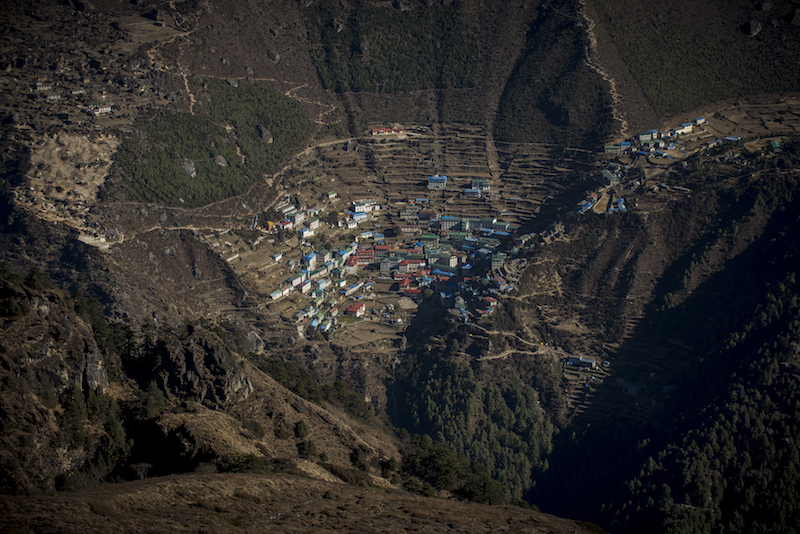 Up past Namche, we had left behind the pool tables and coffee shops for more traditional Sherpa villages like Phortse and Dingboche. Our hosts too were less busy in the December low season, which meant we got to have tea with our lodge owners at least once every day. In the cold, windy nights we were always warm and cheery – sipping tea by the yak-paddie-powered stove, laughing with our Sherpa hosts and playing cards. The higher we went, the more we felt like we had the mountains to ourselves. On those crystal clear days we were almost always the only bideshis (foreigners) around, and even in the villages we never saw many other foreign trekkers. Still, we did make new trekker friends on the trail. After all, when you’re the only foreigners in a tiny Himalayan village and you see each other every day on the trail, it’s hard not to bond. It’s always fun to trade stories on the hike to pass the time – from hearing about Chris and Rickard’s new business ventures to asking our new friend about the cold winters she spent in her yurt in Mongolia. Everyone was in a good mood. The higher we went, the closer we were to the mountain. Ringing in the New Year with S’mores… and waves? When we arrived in Dingboche some were feeling the altitude a bit so we decided to spend a second night there. Our second night also happened to be December 31st, New Years Eve. 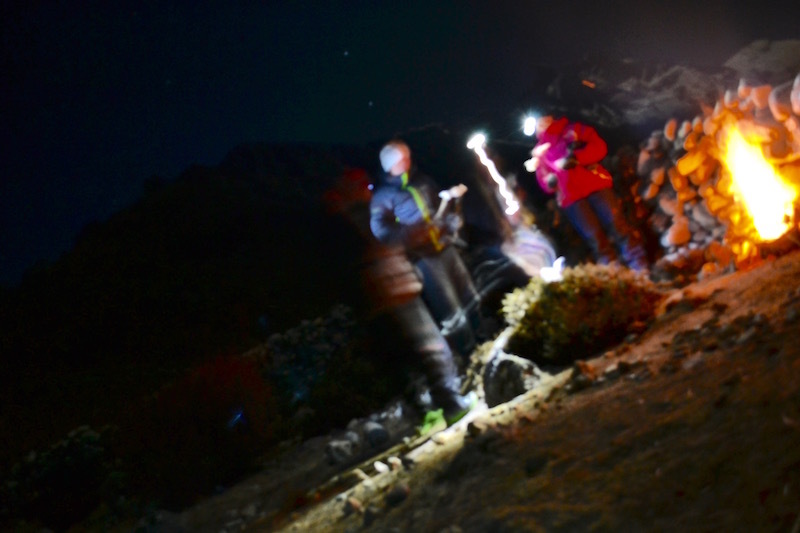 Our trail friends had caught up with us and we all decided we’d meet again at 11:45 PM out by a big boulder just outside the village to light sparklers, drink champagne, and toast the New Year. It was a freezing cold night and I was wearing all the layers I had brought. But the moon was out and it lit Ama Dablam, a nearby mountain, beautifully. Kendra and I had brought s’mores supplies (graham crackers, chocolates, and marshmallows) and the boys managed to start a very small fire – but only enough for a few s’mores before the wind snuffed it out. With our s’mores in hand and a sip of champagne, at midnight, January 1st we rang in the New Year. Our Brazilian friend taught us all a new tradition – to jump over seven waves of water for good luck. Now, being far away from the ocean, we had to improvise a little. What did he do? Our friend threw splashes of water at us to jump over seven times. I’m sure that’s what brought us all good luck the rest of the trek. The next couple of days to get to Gorak Shep, the last village before reaching the base of Everest, felt like a blur. 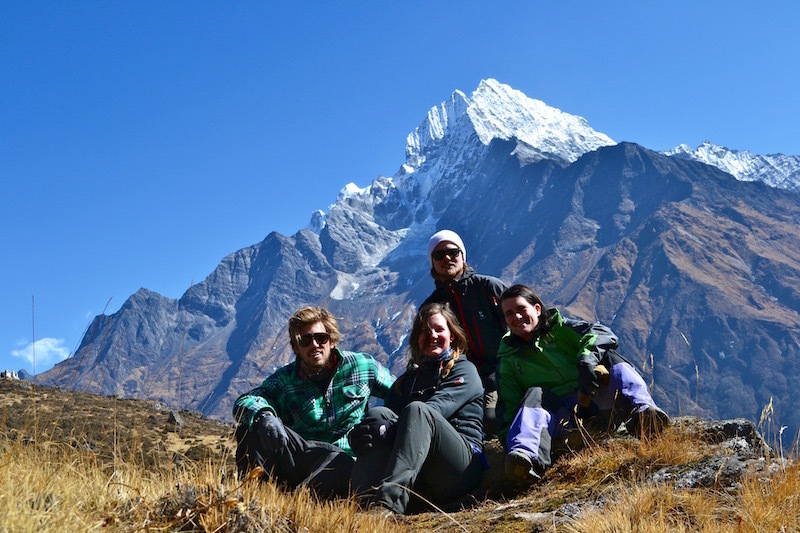 Ama Dablam, New Years, the yaks we counted all fell behind us as we drew closer to Everest. On the climb up to Lobuche we walked through a series of chortens and small stupa memorials to climbers who had perished, most on Mount Everest. People like Scott Fischer and Anatoli Boukreev are remembered here, in the shadow of the great mountain – adventurers who I admired growing up. Mount Everest has a draw like no other place on Earth. I understand the allure that has brought great mountaineers – Nepali and foreign - to this place and why this doesn’t always end well. That allure will never vanish, and it’s why Everest will always be a complicated mountain. When we finally reached Gorak Shep we dropped our bags and headed off with Sujan and our porters to visit the base of Mount Everest. Since it was December, the area was deserted, but we got to climb down onto the glacier that plays host to hundreds of mountaineers every year. Since it is on a glacier, “base camp” moves every year to different points on the ice. Climbing around giant boulders and between icey blocks we finally found a banner with prayer flags and signatures, and we added our names. We could only see the top pyramid part of Everest peaking through behind Nupste from the base camp, but the next morning we got a magnificent view of the mountain at dawn. We left that morning at about 4:30 AM to catch the sunrise up at the 5,644-meter high point called Kalapattar. It was absolutely freezing and the icy wind cut right through our clothes as it gusted over us. Step by step, slowly, we managed to reach the top and looked over the beautiful sight. In front of us stood the mighty Himalaya – hundreds of mountains dotting away into the distance, turning pink and gold in the alpenglow as the sun rose. But all the many mountains we could see, even Ama Dablam, were dwarfed by the massif in front of us– Nuptse, a jagged tooth cutting into the sky, and finally Everest, thrust up behind. Chomolungma was so much larger, more imposing, and more dramatic than I ever could have imagined. Its enormous black pyramid-like upper reaches jut up into the sky, towering over everything around it. There’s no mistaking it for anything other than the highest point on earth, the great Everest. I could barely catch my breath staring at this amazing mountain. But unfortunately all things must end, and so did my meeting with the great Everest. Kendra was altitude sickness and so the two of us decided to sprint back down the mountainside to Gorak Shep to get her some tea. But even down in Gorak Shep, she still wasn’t recovering. So, leaving the boys to carry our daypacks, the two of us decided to keep running down until we got past Lobuche. There’s nothing quite like running down a mountain, especially when the footing is good, the sky is clear, and you’re with a friend. Kendra and I felt like kids sprinting down the trail and jumping from rocks at full speed. When we finally came to a stop we had descended almost 1000 meters! By the time Rickard, Chris, Sujan, and our porters caught up to us, I could see that Kendra was fully recovered – she started teasing the boys as soon as they came into sight. The rest of our descent was fast, so our days were long. In three days going down we covered what took us six days to ascend. The sights passed by quickly… too quickly, and it felt sad to turn the corner into Namche and have to leave the great Chomolugma behind in the distance. Even from far away, I could still feel the draw of the big mountain. It’s a draw I am sure I will return to someday soon. 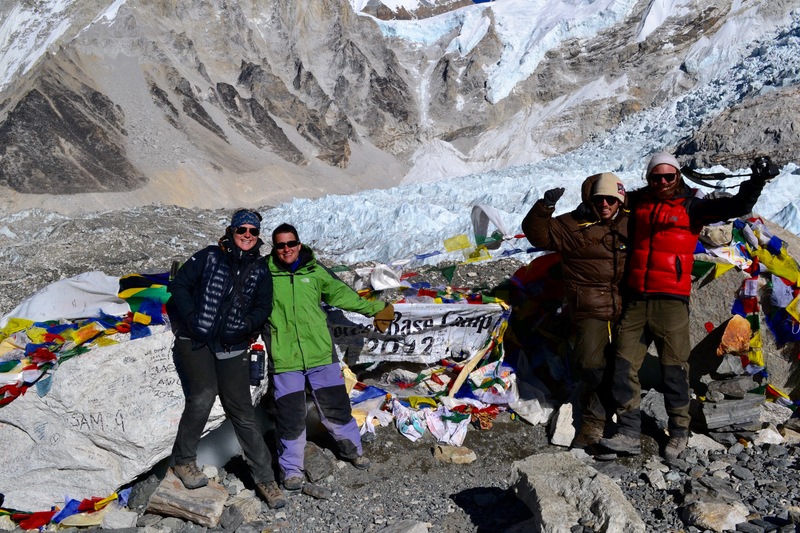 It has now been more than three years since I completed my December trek to Everest Base Camp in 2012/2013. I’ve been on many treks since, in Nepal and in other countries, but this one will always have a special place in my heart. The scenery, the villages, and the absolute feel of the place are like no other on Earth, and I count the days until I can go back. As for going again for another New Year’s celebration? I’d do it in a heartbeat. Not only was the weather stunning and we had the mountains to ourselves, but it was incredibly special for me to celebrate a new year close to a mountain I had dreamt of visiting my whole life. If you have ever wanted to make the pilgrimage and trek to Everest Base Camp, this is the year. Trust me, there’s no better time and no better way to help Nepal than by coming to Nepal. So go ahead. Plan that trip. Come to Nepal this 2016. Olivia Feldman is a writer, editor and aspiring international development worker who has lived and worked all over the world. Having grown up around the mountains of Mexico and South America, she developed a love for the outdoors and high mountains at an early age. She lived in Nepal from 2012-2013, and hasn’t stopped coming back since. 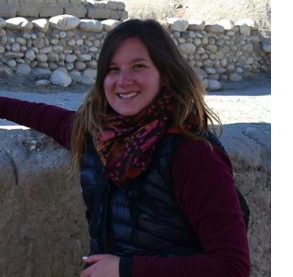 Olivia has travelled extensively throughout Nepal to trek, research, and work.